"For thou, O Lord, singularly hast settled me in hope." The glorious Ascension of Jesus offers believers the hope of one day joining Jesus in heaven. This event in the life of Jesus is the second of the Glorious Mysteries of the Rosary. He commanded them, that they should not depart from Jerusalem, but should wait for the promise of the Father, which you have heard (saith he) by my mouth. For John indeed baptized with water, but you shall be baptized with the Holy Ghost, not many days hence. And he said to them: These are the words which I spoke to you, while I was yet with you, that all things must needs be fulfilled, which are written in the law of Moses, and in the prophets, and in the psalms, concerning me. Then he opened their understanding, that they might understand the scriptures. And when he had said these things, while they looked on, he was raised up: and a cloud received him out of their sight. And while they were beholding him going up to heaven, behold two men stood by them in white garments. 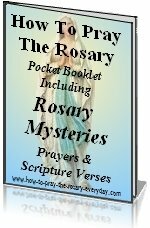 The Bible passages used for this scriptural rosary mystery were taken from the timeless Douay-Rheims Catholic Bible. the glory of the sons of God." Living a holy life on earth, gives you the right to hope for an eternal reward. Through the merits of Jesus' passion and death, you can hope that your sins will be forgiven and that you will receive the graces to live a holy life and die a happy death. As your faith in Jesus deepens, you will naturally place all your hope in Him. Jesus should be the foundation of all your happiness and peace because He is merciful and fulfills His promises as in the Ascension of Jesus. The Ascension of Jesus highlights the cardinal virtue of hope. 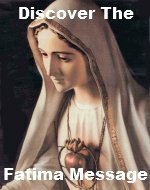 The true concept of Catholic hope is recognizing that on account of Jesus' merits, your sins will be forgiven, you will receive the grace to live a holy life, you will persevere in the faith until death, and finally you will be rewarded when you join Jesus and His Holy Mother Mary in heaven. The Ascension of Jesus and the Assumption of Mary let you know that they are there waiting for you to join them. There are excellent numerous books written to help you with your spiritural excercises, one being The Spiritual Exercises by St. Ignatius of Loyola, that we highly recommend.